We have so many great classes lined up for you next month. I have two myself and there are several others by both Angela McDaniel and Angela Collinwood which will be advertised by HKMC soon. 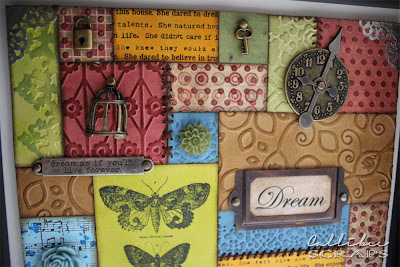 For my first class, we will be making a patchwork shadow box. 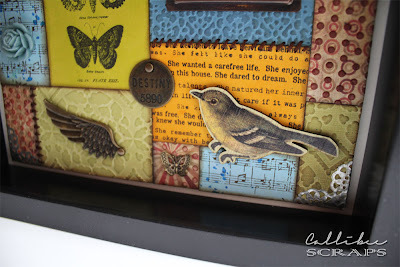 I saw this in the Ranger booth at the CHA show early in the year which I believe is a Tim Holtz creation. I think he calls it "Patchwork Pandemonium" and I've been dying to recreate it for a while. There is a whole range of techniques on it and looks so great as a home display. An 8" x 8" (20cm x 20cm) patchwork board encased in a 10" x10" (25cm x 25cm) shadow box. Display case glass was removed for photographic reasons. Lots of colours and techniques. A variety of trinkets and embellishments to choose from. This class will run on 6th (Tuesday) and 8th (Thursday) November 2012 (choose one date). Run time is as usual from 7:30pm to 10pm at the HKMC shop in Sheung Wan. 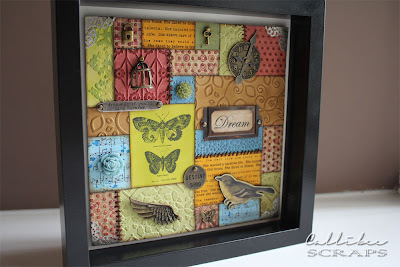 The class will include all materials used plus the shadowbox for you to take home. My second class for November will be centred around the eClips eCAL system. This class is targeted towards those who already have the Sizzix eClips and want to learn how to design and cut your own images. You will need to bring a laptop with your copy of the eCAL software loaded, registered and authenticated. You will also take home a tag made with your cut out designs. This class will be on 22nd (Thursday) November 2012 from 7:30pm to 10pm at the shop. For details on pricing and availability for both these classes, please contact Erika Lui at 2559 0175 or email info@hkmemorychestonline.cominfo@hkmemorychestonline.com. So, keep your eyes peeled for all the other classes coming in November from the other HKMC instructors. We will have some other eClips classes as well as mixed media ones. If you aren't already on their mailing list, give Erika a buzz and she'll gladly add you on.